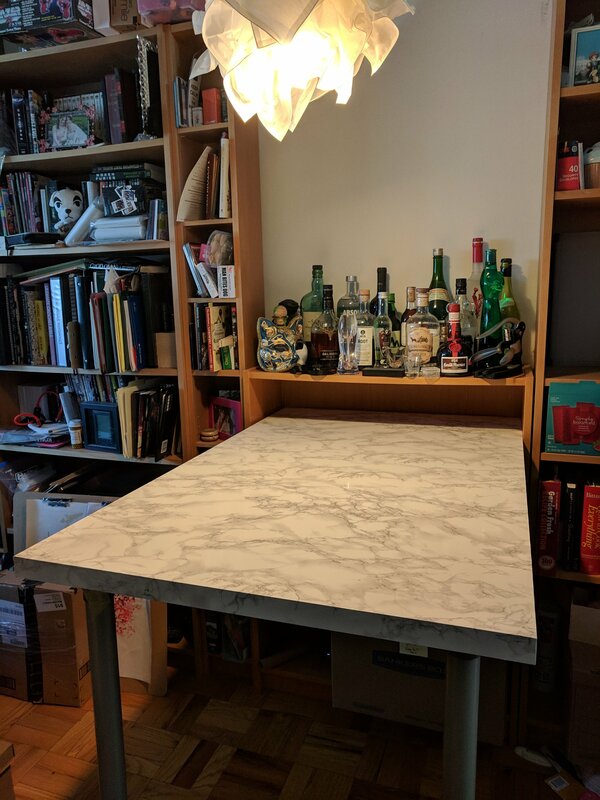 Never thought I’d be doing this, but a little contact paper on this table has turned it from a horizontal surface for junk mail, back into a dining room table. The application wasn’t too difficult and there were issues, but I’m at a place in my life where I realize that done is in many cases better than perfect. I would have been mad or disappointed in myself with this application in the past because I believed everything had to be perfect. Now I guess with wisdom and some self awareness, I’m finally able to forgive myself. I think it looks great, can’t wait to get it applied on to the kitchen counters after our Doctor / R2 paint job. In particular, the broad definition of Singularity where we as a society have progressed, technology wise, to a place where we were unable to even conceptualize what it would be like. Twenty years later, I am at home, taking a lunch break. I turn on my console and invite one of those friends (one of the same ones I was playing GoldenEye with) to a party chat. The voice quality is very good, they sound like they are in the room. I’m playing on a flat screen LCD television, only 1080p, I’m thinking about upgrading to 4k maybe after our tax returns are processed. We’re playing Anthem, taking down scores of Dominion soldiers, and just chatting and catching up as we play video games. In short, the every day experience of playing video games has changed past the point I could even conceive of in 1997, but I’m also playing video games with the same people I played with over 20 years ago, which is also amazing. I don’t know how they’re going to change from this point on. We have VR, we have the infrastructure, but honestly if we (as human beings) can make it another 25 years I’m pretty certain that the video games that my nieces and nephews will be playing will be nearly indistinguishable from the games we’re playing now. But I’ll hopefully be playing them with the same good people. Watched How to Train Your Dragon 3. It’s a good wrap up to the series, very bittersweet, but also just a satisfying ending. Up above is a picture in near darkness, courtesy of the Google Pixel Night Sight. Continually impressed with the software innovations that trickle down to the Google Pixel line, even to older versions of the hardware like my first generations Pixel. This picture will end up being slightly indicative of my emotional state during the movie, since the movie theater was filled with mostly children and surprisingly, annoyingly chatty adults that had to be shushed one or two times. Right now I’m playing the video game Anthem, and watching my cat play with a newly rediscovered toy of his. I’m also blogging. I’ve taken some time off from work and given myself a gift: Some time to myself. One of those things is writing again, a sort of jump start. Some of the product of that journaling and writing was the discovery of a project. I blogged semi regularly before, but never really had a strong focus for it. Right now I’m still collecting thoughts on paper, and beginning to get my research accessible and all in one place. It’s going to involve some pictures, some links on the internet, maybe some names will be changed, maybe not? If a person is named on the internet but is never tagged in social media, were they ever really named at all? It’ll be an exercise more than anything else. A direction, certainly, a destination? I can’t say. I’ll try to make it sound like we haven’t talked in a while and I’m catching you up.